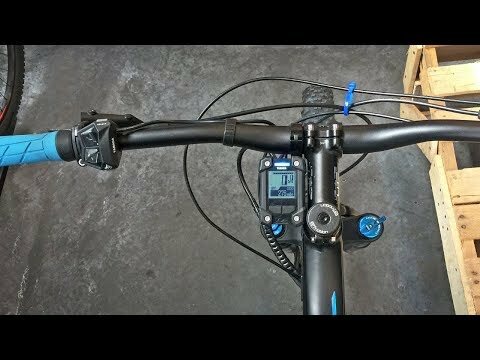 While visiting the original BH North American headquarters in Southern California, I was able to spend some time digging into the Yamaha PW-X LCD display control pad for an Easy Motion Electric bike. In this video, I show how to change units from miles to kilometers, how to clear trip distance, how to activate lights, and how to enable walk mode. This display is incredibly deep with lots of different configuration options in the settings menu. It is not removable or adjustable angle, it has a blue backlight color, a 5 volt 500 milliamp Micro-USB port built into the base for charging accessories and doing firmware updates and diagnostics that must be activated through the menu system. To get to the settings menu, hold the Select key for several seconds. The sub-menus here include: Stop Watch, Time Adjust, Distance Units, Display Item (add or remove items from the default menu list to make it faster to cycle through readouts), Reset, BLE (Bluetooth Low Energy, On/Off, for heart rate monitor or app), USB (power output or diagnostics), LED (on or off for the color bar at the top of the display). Pros: This display is compact and positioned strategically to reduce damage when mountain biking, instead of mounting it to the top of the handlebar or stem, Yamaha designed it to sit just to the left side of the stem. It uses a color LED system to quickly communicate assist level so you don’t have to focus and squint, the color LED readout can be de-activated if you feel distracted by it, the display is easy to navigate with a reachable control pad with uniquely shaped and large tactile buttons on top. Cons: Walk mode does not seem to work on some versions of this display, specifically in North America (perhaps it is just for Easy Motion models? ), the screen size is very small and not as easy to read as some of the larger or color models from other companies, it cannot be swiveled to adjust glare or removed without tools.